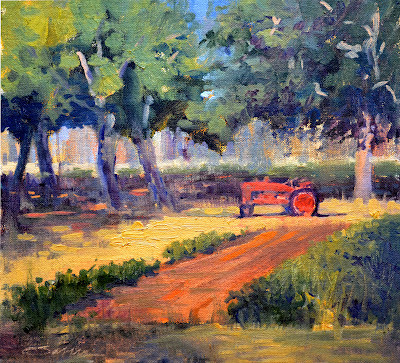 Randy Saffle - In the Field: Plein Air Painting Adventures: Must read comments! I asked painter Colin Page, whose work I highly look up too, an interesting question on his Blog and he allowed me to repost his answer. Colin wrote... This is a tricky question, and the answer really depends on my mood on the day in question. Sometimes I am struggling with every part of a painting and I get in such a funk that I don’t think anything I have painted has any value, and other days I feel like I can do no wrong while standing at the easel. Of course it feels better to have a good day, but they are rare. Usually I am seeing things I want to get better at. Even though it is frustrating to constantly see flaws in our work, that is the only way to improve. If we don’t see flaws in our paintings, we become repetitive and uninteresting. To push painting to better results we always have to be a little disappointed in our work. We have to know that we can do better, and even though the painting you just finished may be the result of your most sincere hard work and effort, we have to know that the lessons from that painting will help do the next painting better. The painters whose careers produced the highest quality work were all searching for something just out of reach and doing everything they could to capture something fleeting. It may drive you crazy and be disappointing. But look at your earlier work and the improvements you’ve already made and imagine how much further you can go from here. A creative life is a constant battle between the disheartening and the hopeful. I plan on printing this out and keeping it next to my easel to help encourage me on those tough days. Thank you Colin for your thoughts and for allowing me to repost. I encourage you to check out Colin's work because his paintings are every bit as inspiring as his words. Hi there!... My first visit to your grand site! Consistently great variety of subject matter or theme colour... and highly interesting compositions which maintain a pleasant painterly quality! Enjoyed my visit... I'll be back soon for another look-see! Bruce, Thank you for the visit and the great compliments too! You made my day. I enjoyed your site too! Wow! This is a great post Randy. I am experiencing exactly what you are talking about in this post. I can paint something I love one week and something I hate the next. Many times I am even unsure about myself. I am happy that I am not the only one and that it is a sign that I am learning and becoming a better artist. Thank you for sharing! Randy, your work is amazing. I just love the trucks and tractors you paint. Your compositions are perfect. Keep up the great work!